Here is issue 2 of The classic Inside Motocross magazine. 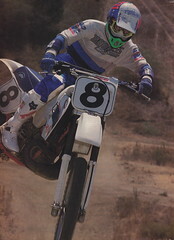 Jim Hale of AXO Sport fame introduced Inside Motocross in 1993 with noted photographer Fran Kuhn at the helm. All told, they only produced 4 issues of the magazine before it was shut down due to pressure from inside in the industry (primarily from Motocross Action’s Jody Weise and Roland Hinz, who felt Inside Motocross was a direct competitor and conflict of interest for AXO Sport and their advertising relationship). Issue #2 is probably my favorite of the 4 issues, with several great articles and the spectacular photography that made the magazine so special. Here is the full PDF of the complete magazine, with all the ads and photos included. I am also attaching a YouTube video I made in a classic commentary style where I go through the magazine page-by-page and add my thoughts and comments on the pictures, ads, and articles contained in issue 2. I hope everyone enjoys this walk down memory lane.